About a year ago, someone on a Facebook-group posted a few questions about the sine wave motion. I stumbled on my reply to these questions and thought that they might be interesting to some readers of my blog. Does sine wave and knee spring action describe the same motion? Many Korean activities refer to the bending and extending of the knees. Different activities use different terms. For instance the term used in traditional dance might be different from the term used in Taekkyeon, but in practice it is basically the same principle. One such a term is ogeum-jil 오금 질. Ogeum literally refers to the back of the knee and jil means an action; in other words, the bending action of the knee joint. Although I haven’t confirmed this, it is likely that the term “knee spring” which was one of the early terms associated with ITF Taekwon-Do’s sine wave motion may have been a rough translation of ogeum-jil. Another term used in more everyday situations to describe the up-and-down motion accomplished by the bending of the knee gumshil 굼실. This term can for instance be used to describe the oscillating, wave-like locomotion of a worm, and is a term I’ve come across in Taekkyeon to describe their bouncy stepping. Finally, to answer the question, it is my opinion that knee-spring and sine-wave motion is the same thing in as far the sine-wave motion is most often accomplished through knee-spring. When performing a sine wave, is the movement always “down, up/down”? My simple answer is no. Although the most common expression of the sine wave motion is “relax-rise-fall”, this is not the only way it manifests. Take for instance the palm upward block in Gae-Baek Teul where the motion is relax-rise. I personally also do my forearm rising blocks as relax-rise. There are also instances where you may already be in a “raised” position and only dropping is necessary, or you are already in a lowered position and you may only want to rise (imagine doing an upward punch, moving from an L-stance to a vertical stance). It is useful to think of sine wave motion as the vertical displacement of the body mass. In traditional Korean dance, this is referred to as “verticality”. Sometimes you want do drop your body mass, other times you may want to lift your body mass. It all depends on the technique and purpose. Is a sine wave performed for every technique execution? If you think of the sinewave motion as “relax-rise-fall”, then the answer is no. There are however two principles of what the sinewave motion tries to accomplish in practically every technique; (1) starting from relaxation and (2) accelerating the body mass in the direction of the technique. An interesting related question is if hip twist is performed in every technique. To this I would answer no, as well. There are for example techniques such as a wedging block or twin punch that does not contain a hip-twist as you can’t rotate your hips in opposite directions at the same time. Many techniques benefit from both a sine wave motion and a hip-twist, while some techniques can only benefit from one or the other. What movement causes the initial downward motion? Does a sine wave motion include a knee spring action? Yes. See, the answer to the first question. 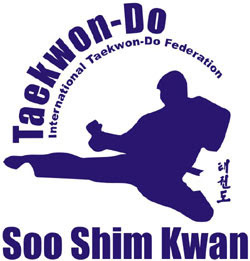 When did Taekwon-Do introduce the “down, up/down” motion? When I look at old footage, I recognize the seeds for “verticality” already from the late 1950s. It seems that it only became formalized in the 1980s, when the initial relaxation became emphasized. This conscious relaxation is, in my mind, the most dramatic evolution to Taekwon-Do movement. Is hip twist used to help power a technique? Yes. Acceleration of the body mass in the direction of the technique is accomplished in two ways: hip twist and rising or dropping the body in the direction of the technique. To initiate a step, does the student push off with the foot in motion, relax the stationary knee or both? It depends on the technique, the initial stance and the next stance. (See a related post: "Motion Without Movement." Does the 2017 North Korean Demo Team in Muju perform sine wave during Chon-Ji? If so, during which movements?